Isolde Beauty: Spring has sprung, time for some new clothes! It's really spring here! We have warm and sunny weather. I really hope it stays around. With it comes a tide of new spring clothes! Yes, I know, I need more clothes like I need a hole in my head, but I couldn't *not* share this! J. Crew is currently offering free *international* shipping, free returns, and duty-free shopping!! By *international* they mean anyone outside the US. So I've just ordered a few things... looking forward to it! Unfortunately taxes were not included but added at checkout. I didn't really get this, in the UK taxes are included in the price, and when I shop duty-free here, that means there's no tax, so it's 20% less... oh well. It's still an amazing offer. It's available from now until the end of April 2012. If you're a fan of their clothes, check it out! 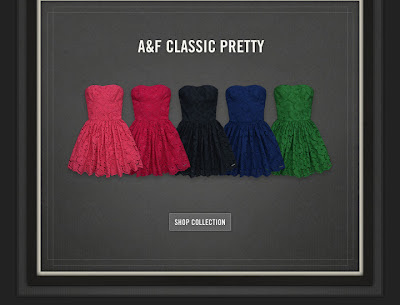 I also got an email from Abercrombie & Fitch with some gorgeous lace dresses that I have to share as well. Aren't they lovely?! Have you made any spring purchases? Oh gosh I love those dresses!! I want black and hot pink! You would rock those dresses! Other than a long cardigan from Joe Brown to get me through the on again, off again cold spells this time of year, I've not bought any thing. And yes, those dresses are sweet. The weather can't really make up its mind, can it!? It was so foggy here this morning, but now it's warm and sunny!